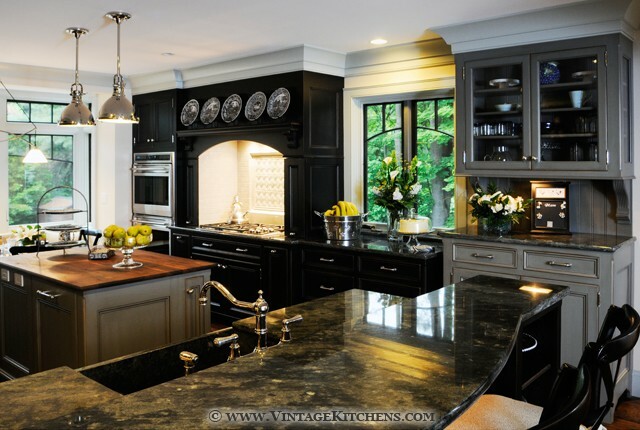 This comfortably elegant kitchen makes its home in a vintage 1930's brick house that is reminiscent of an old world country Manor House. 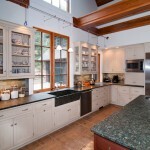 The Quality Custom Cabinetry features an artistic painted finish, as well as a couple of special details crafted in our own shop. A graceful arch sweeps over the cherry island. 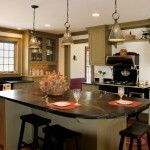 A beautiful soapstone slab tops the island in this kitchen. 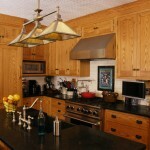 This turn-of-the-century home still has nearly all of its original oak woodwork, which made oak a natural for this new Vintage Custom Cabinetry kitchen. 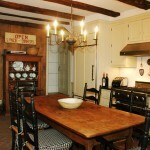 The formal dining is in the room beyond. You get a good view of the two-sided pantry from here. 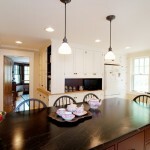 The cabinets are a combination of Quality and our own shop in cherry. 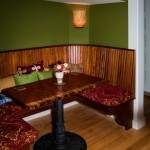 We designed and our own shop built a cozy little banquette with wrap-around mahogany seating. 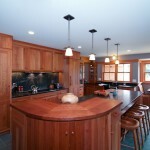 The lighting is transcluscent lathe-turned Aspen by Peter Bloch, which gives off a welcoming warm light. 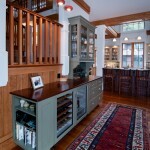 We rebuilt this pass-through with a new display cabinet featuring custom leaded glass doors in authentic Craftsman Style. Copyright © Vintage Kitchens. All rights reserved.